Remember those little riots in London in the summer? One feature of them was the way information, and misinformation, spread rapidly across the internet. 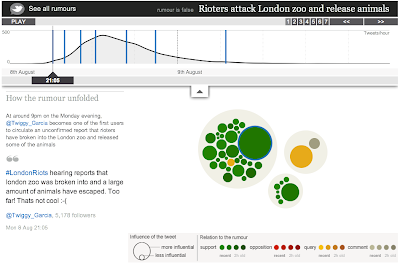 The Guardian has visualised the spread of some of these rumours in a beautiful interactive graphic. How long did people believe that a tiger had been released, and was running rampage across Primrose Hill? Go check it out. The Journey of Mankind. 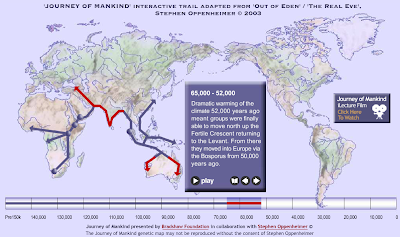 Ever wanted to see the path early man took to spread across the world? Well take a look at this. It's not the prettiest program in the world, but fascinating nonetheless. I'm not sure where I found all of the links this time around, but if you're looking for the sources, the "Links I Love" on the right is a good place to start.